There’s a new sheriff in town. Or so ThermalStrike claims. The company behind one of the original bed bug heaters has kicked their product designs up a few notches this year having just released the most advanced heater on the market. The ThermalStrike Ranger is unlike any other bed bug heater – it uses a new assembly and a new heating method to set itself apart from the growing crowd of options. Does this sheriff have what it takes to clean up the town? Let’s find out. The box that the Ranger arrived in was deceptively small. It seemed more suitable to holding a laptop than a bed bug heater that’s supposed to be large enough to treat my luggage. The packaging was attractive, and the hard plastic carrying handle on the top was a nice touch. Unboxing the Ranger revealed the mystery to the size of the box: the Ranger is folded up into a very compact form. When not in use, this is a heater that is very easily tucked into a closet and forgotten about. Along with the heater itself, the box includes a plastic support base, a wired thermometer probe, and a simple instruction manual. Bed bug heaters don’t get any easier to set up than the Ranger. All you have to do is unfold the heater and put the support pad inside. That’s it – it’s ready for whatever you want to treat. Once it’s fully assembled, the Ranger will feel a little loose and saggy. That’s because it has no internal frame, like most bed bug heaters; instead, the Ranger gets its rigidity from the contents that you put inside. The Ranger is designed primarily for treating luggage after a trip (since this is possibly the most common way that people get bed bug infestations). It’s sized to accommodate most carry-on or roller-style suitcases up to 27 inches tall. The luggage I used was exactly that, so putting that in allowed the Ranger to stand perfectly upright. The construction of the heater is top-notch. The outer cover is made of 420D nylon, which is durable enough to take years of use and abuse. There’s also a sealed PVC enclosure that zips up from the top to prevent bed bugs from escaping. The timer is easy to use, and built right into the power cord. I don’t think ThermalStrike could make a bed bug heater easier to use if they tried. The Ranger is just idiot-proof. Put your stuff inside, zip it up, and plug it in. The timer is on the cord, and has clear numbers for how long you want to heat for. No fiddling with heater units, support frames, or noisy ventilation fans. The Ranger is capable of treating an empty suitcase in as little as 2 hours, but having stuff inside extends the treatment time to anywhere from 4 to 8 hours. It’s sort of like cooking a turkey – since we don’t know how big your bird is, or what it’s stuffed with, we can’t tell you exactly how long it’s going to take to cook. Remember, bed bugs of all life stages will die in minutes when exposed to a temperature of at least 118° Fahrenheit. The Ranger is capable of heating all of its contents over 120°, but it takes time for insulated items to reach that temperature throughout. Luckily, the Ranger’s unique heating method makes this easier. Instead of a large heating unit blowing hot air into the box, the Ranger hides hot conductors inside of all six walls. 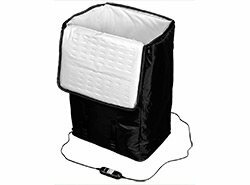 This allows the heater to surround the object(s) being treated with heat, preventing cold spots that bed bugs can survive in. Once you set a time on the timer, the blue light clicks on, indicating that the Ranger has started its treatment cycle. When the timer runs out, the blue light (and the heater itself) will automatically turn off. After you let the items cool for a little while, you can unzip the Ranger and retrieve your (now bed bug-free) items. I believe that the Ranger is going to make bed bug heat treatments mainstream. In light of the current bed bug epidemic, I believe that every home should have a Ranger stashed away somewhere. It’s so compact, so easy to use, so well made, and so affordable, that I have a hard time finding faults with it. Whether you’re a frequent flyer, or just looking for a bang-for-the-buck bed bug prevention solution, you owe it to yourself to give the ThermalStrike Ranger a good look. Kill bed bugs hiding in your luggage with the ThermalStrike Ranger. Just place your suitcase inside, zip the lid shut, and start the timer.